Today’s Featured Ebay Auction showcases two rare figures from the 1979 Pocket Heroes line-up from Mego. These are from the hard to find series 2 set, which came with “denim” packaging. 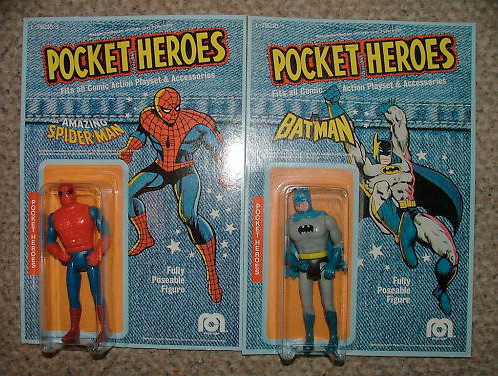 So check out the MEGO SPIDERMAN BATMAN POCKET HEROES ON RARE DENIM CARDS from Ebay seller missmay1974. The figures are mint on the sealed card (MOSC) and look to be in excellent condition. If you like these, why not check out the other Comic Book Heroes Toys listed. Click the thumbnail to check out a photo. Not old enough to have any appreciation of these, and even if I were, I STILL wouldn't care about MEGO. Honestly, I was always more impressed with friggin' Barbie dolls. wow. what an epically ignorant response. without mego it's doubtful you would have ANY of the toys you DO care about today. I own a few toys from this line and those are beautiful on the card specimens, but I will never get over the hand placement on the heroes in that line. I got a few of these for Christmas in 79. Cool. Mad because I don't love them as much as you do? Well, too bad. You can call a twelve inch GI Joe an action figure if you want, but it's really just a Ken doll who forgot to shave. If anyone should get credit for the modern action figure, I think it should be Takara and Mego for Microman, and Kenner for giving us Star Wars. Just showing him who wasn't "first," that's all. Nothing more. Besides, if someone called you ignorant for voicing an opinion, how would YOU respond? i was not calling you ignorant. i was calling your STATEMENT ignorant. ignorance is roughly defined as "uninformed". and i never wrote that mego was "first". but if you think for one second that you would have the toys you like today WITHOUT mego, then it is my opinion that you are uninformed. it is also my opinion that as collectors (at the very least) we should be able to appreciate what mego brought to the table and how they changed the industry. 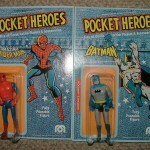 the pocket heroes were the first 1/18th scale super hero figures that were produced in america. so it was a pretty big deal. You have the right to your OPINION... same as me... mine is just that I DON'T LIKE MEGO. And next time, just leave the "ignorant" part out... cuts down on the confusion.